Legacy Leg Pillow Reviews - Too Good to be True? The Legacy Leg Pillow is a crescent-shaped memory foam pillow that you can place between your knees and upper thighs as you sleep on your side. It's been designed to help you keep your back, hips, and spine positioned in accordance with the natural alignment of your body, so you don't wake up with aches and pains. Each of these pillows is also ventilated with air holes, an attribute that's meant to keep each one cool and dry as it rests between a user's legs. The cost of Legacy Leg Pillow is $19.99 plus $6.99 shipping. The special TV offer allows you to receive a second Legacy Leg Pillow at the discounted price of only $6.99 for a total price of $33.97. This price was obtained from the As Seen on TV commercial page ( www.getlegacypillow.com ) which was taken offline due to Legacy Leg Pillow being discontinued. Legacy Leg Pillow may still be found for sale on Amazon or Ebay. If you're a side sleeper, regardless of what side you're sleeping on, you've probably been tempted to throw one leg up and over the other so it's resting further forward than that other leg. This position can be bad for the body since it causes the lower back and pelvis to twist and thereby applies pressure to the spine. However, when you have a Legacy Leg Pillow between your thighs and knees, you'll be less tempted to move your body into this particular posture. Instead, the pillow will encourage you to keep your lower back, pelvis and entire spine straight so there's no pressure on those body parts or any nearby ones. Each pillow isn't rock-hard, either, which means it'll be able to conform to the shape of your legs as it does its job. Before you slide your Legacy Leg Pillow between your legs, lie down on one side like you normally would. Next, slide your pillow between your thighs, with the narrower, pointier end pointing towards your feet as opposed to your head. If you've got the pillow in the right place, it should be hanging just two or three inches below your knees. Unless you have extremely short legs, it should not extend quite all the way up to your crotch in the other direction. The groove in the pillow must be directly between your two legs in order for the pillow to work properly. After you've determined that your pillow is in the correct position, get ready to go to sleep as usual. Once you're asleep, the pillow should move with you if you toss and turn a bit, instead of sliding out from between your legs. It if happens to move, you may have to experiment with how high or how low you're positioning it. Some similar pillows have a bulkier rectangular shape, but this one is shaped more like a crescent. This will enable it to hug the curves and contours of your body more closely, without slipping out of position, instead of feeling like a dead weight between your legs. Each Legacy Leg Pillow is ventilated with a handful of air holes that will prevent it from becoming hot or sweaty, and therefore uncomfortable, as you use it. As air continuously flows through the pillow, the entire thing will remain cool and dry, even if you sweat in bed or sleep in a warm room. Every one of these pillows comes in a shade of light blue, but each one also comes with a machine washable white fabric cover with a blue stripe. If you happen to get food, makeup or some other messy substance on your pillow's cover, you'll be able to remove it, toss it in the washing machine and have it clean in an hour. When it's clean, it's best to let it air-dry instead of drying it in a machine, though. The Legacy Leg Pillow is made from memory foam that's flexible enough to bend a bit to accommodate the curves of your legs. Yet, this foam isn't so soft that it'll go flat on you while you're sleeping. Furthermore, it will never lose its crescent shape, no matter how hard you squeeze it between your thighs. This type of pillow promotes solid and restful sleep, whether you sleep alone or with a partner. After you start using it, you may notice that you don't wake up in the night feeling achy and that you wake up in the morning feeling energized instead of stiff. If you share a bed with a partner, both of you will be able to use your own pillow, and will likely experience steadier periods of sleep that don't involve unintentionally waking each other up. This, in turn, means you'll have more energy for important tasks and activities during the daytime. One common problem for side sleepers is that their knees tend to rub together and the skin on each knee eventually begins to chafe off. By keeping your knees slightly separated, however, a Legacy Leg Pillow will help remedy this issue, and you won't need to avoid wearing short skirts or shorts any longer. On a slightly grosser note, you also won't end up with a bunch of dead skin on your bedsheets. By correcting your posture at nighttime, your Legacy Leg Pillow might actually be able to improve your posture during the day, too. Humans are creatures of habit, so if you get used to having your spine, hips, and pelvis aligned in a certain way at night, you may automatically align them that way during the day. The Legacy Leg Pillow is ideal for side sleepers but is not ideal for back and stomach sleepers. If you were to place this pillow between your knees and upper thighs and lie on your back or stomach, the front or back of it would end up poking into your mattress. It might even raise your body a couple of inches up above the mattress, which probably wouldn't be a comfortable position for anyone. Consequently, if you're a person who doesn't sleep exclusively on either side, this might not be the best pillow for you. For an optimum level of support, it's safe to use two of the Legacy Leg Pillows at once. If you go this route, place one of the pillows just above your knees and the other one just below. Even though neither one may be touching your knees at all, both of them will work together to keep them positioned slightly apart. If you regularly go to appointments at a chiropractor or physiotherapist's office, due to back or hip pain, you may no longer need to go as often after you begin using one of these pillows. This won't be true in all situations, but it may turn out that all your pain is caused by a poor sleeping position, which this pillow will correct. If that's the case, you might even be able to eliminate your appointments—and the time you spend driving there and sitting in the waiting room—altogether. Do not buy Legacy Leg Pillow online before searching Amazon. Well! I'm a totally satisfied customer. Ordered 2 of the pillow/leg pillow specials from the TV commercial. I've been using both of the leg pillows as demonstrated on the commercial for a month or so EVERY NIGHT and the difference in my legs, back, knees, and especially hips are amazing. I was using a large pillow to "balance" my legs but the difference is wonderful. My husband agrees! I can see from the reviews that most of your customers have had difficulty with customer service but we got immediate order and shipping confirmation and, for us, everything went well. We are using the pillows, covered with waterproof covers as seats for our outdoor dual rocking chair. Perfect! Good Morning Nadia, I am happy to hear the product is working out so well for you - when we hear comments like this, all the hard work, sweat and sometimes tears makes it all worth it. While we do understand that working with external Media companies to handle customer service, we hope for the TV launch we can handle each and every customer in the house to make sure they are receiving the highest level of customer service and experience. Kate. I was really interested in this product until I read all the reviews and saw that the Customer Service aspect was really bad. Too many problems to be worth the risk. I will find something elsewhere. Good Morning Marty, As a fellow online shopper, I to do my fair share of investigating my purchases as well. While we did initially launch this with an outside customer service team, we have reeled in Customer Service and can ensure a positive customer experience when you purchase online through our site directly or Amazon:) Have a Great Day! Kate. The TV commercial said if you order 1 leg pillow, you would receive one free? I received only 1? Good Morning Kathy, For the TV offer, when you order the leg pillow, you can receive 1 free head pillow. However, when you are placing the order, you have to opt into the head pillow to be FTC compliant. If you contact customer service, they should be able to take care of this for you directly. They may be reached at 973-287-5124. Have a Great Day! Kate. Only got one pillow and leg brace need other half of order one pillow and one leg brace cushion not happy with how order came. Good Morning Dennis, Please review your tracking information, as it may have been split into 2 shipments. I would recommend contacting customer service directly so they can resolve any issue that you may have. Have a Great Day! Kate. I like the knee & free foam head pillow (and did receive them in a timely manner). Just would like to know washing instructions for both. Also would like to get a cover for the head pillow. I was on the Legacy website, but my request does not seem to be submitting. Good Morning Kim, Those are very valid points, and our internal team is working on an insert to provide that type of product information. The cover is removable and washable, I would recommend drying on low-med heat setting on a gentle cycle, or line drying. The foam is spot clean only, getting foam wet would cause it to breakdown. As for a pillowcase, any standard pillowcase would fit that pillow, you can also order them from our direct website, https://www.contourliving.com. If you have any other questions or concerns, please feel free to reach out to me directly, Have a Great Day! Kate. I have not received my pillows? It's going to be 36 days 19.99 plus 5.99 please call me at 9725957201. I have been trying to reach you and nothing my card is in edelmira rodriguez. Good Afternoon Delmi, The TV campaign is handled by a 3P As Seen On TV Media company, you will need to reach out directly to them. If you have not received your item yet, you may be in an RA bucket as there may be a problem with your payment. Please reach out to customer service directly at 973-287-5174. Have a Comfortable Day! Kate P.S - Please note, this is not a website we have an affiliation with or manage regularly. For any customer service issues please contact support@getlegacypillow.com. For escalation, you can reach me with your order details at support@legacypillow.com. I want to pay by check but they don't accept them. There's no way in the world I would give my bank card info. To these people, especially after reading the negative reviews all over the internet. Good Afternoon Paulina, I don't know who you spoke to, but we do actually accept mailed in checks as well. You can contact me directly and we can process that for you. Please note, the negative reviews you are reading are really only here - the product and our brand actually has very high seller market place ratings. The reviews you are seeing from back in 2018 & January are negative due to back order, which was unfortunate, but something we have since resolved. Kate. Yes, I would also like to order the leg pillow and. The free head pillow. But, I want to add a check. Please provide me with the complete total of both of these and address to send the check. Thank you. Hello Connie, I am sorry for the delay as this is a third party site that we do not monitor. To place your order by check, please contact our customer service team at 800-950-0230 and they would be happy to help you. Have a Comfortable Day! Kate. I heard the advertisement, liked it and ordered. I received the 3 knee pillows and we all like them. I never received the head pillows. When I called customer service and asked why I did not receive the complete order, they said I did not pay for the extra shipping of the head pillows. I said okay please charge and send the three heads pillows as you advertised. I was told no that I now would have to pay full price for the pillows and shipping. This is not fair. Bad customer service. I was totally going to order this product. But after reading these reviews I'm glad I am not going to order. Just the customer service reviews and how people are not getting their orders being charged correctly or credited correctly I'll continue to use my pillow instead of ordering from this company. Linda, Thank you for your feedback, we did have some issues early during launch as people were confused with the automated system, which we are going to be transitioning to live agents for the TV campaign. However, I do really appreciate the time and high level of buyer due diligence here, as honestly, I would have made the same decision, but fortunately, I have the true view of this side:) Have a Great Day! Kate. Used it first time. Really works. I woke up with no back pain. Highly recommended. Good Afternoon Dennis, I am so happy to hear that the Legacy Leg Pillow is working out for you. Our main goal was for better sleep no matter what your pain point maybe:) If you have any questions or issues moving forward, do not hesitate to reach out directly:) Have a Comfortable Day (and night), Kate @ Contour. Kate - your reply confused me as I was about to order the knee pillow. I don't need "better sleep" as you suggest the "main goal" is for your pillow, but I wake with hip pain, as does my spouse. As side-sleepers, both with left hip pain, it makes sense that our alignment could be off. So what is the main goal? (changing positions, for me, stops my pain, but my spouse is still when he gets out of bed so we have different things going on). Tks! I made a purchase online on a Saturday, I saw the transaction posted on my credit card account the next day. I was charged again on the following Monday and received confirmation of shipment. Nine days later they still did not release the hold on the credit card. When I called customer service to find out the status they gave me a bogus Transaction ID and Authorization Code. I called my bank that the card is with and they will be canceling the transaction since the company never did. The pillows were to be delivered today but of course, are postponed. I have not received the pillows yet and already regret purchasing them. Good Morning Deb, I am sorry to hear about your experience with your transaction. Your card is authorized first, this is to ensure the funds are available for the transaction. It is up to the bank to release those funds back to you. Some banks are the next day, some banks can take up to 7-10 days. But you are not charged twice. If you could email me your order number and I can take to the department that is handling these fulfilment transactions. Have a Great Day! Kate. It looks like to me looking at the reviews that orders are coming in. But seems orders are not going out, bc backlog order not available at a certain time. I was considering ordering but very disappointing about the reviews. Maybe, later when you get orders out in a timely manner. Good Morning Thomas, We currently have not had items back ordered since the end of January, and everything is being processed and shipping within 2-3 day time period of when order was placed. If you have any concerns about your shipment, it is also available through Amazon to ensure quick delivery times. I ordered The contour pillow and paid extra for the head pillow. The head pillow is nothing more than a foam rubber egg crate it is not worth it. I wanted to return it and they said they do not refund the extra processing and shipping charges! Good Morning Judy, Well it was a free item, and because of the nature of the items, and health code laws we would have to destroy and dispose of the product. However, if you could send me a direct email with your order details, I can investigate your order with the Customer Service team. Have a Comfortable Day! Kate. There was NOT ONE positive review! So I am certainly not buying this. Christa, I totally understand your concern, but this is universally a complaint board. If you based these few questions on the number of legacy orders we have shipped out, it wouldn't even be. 0001% of customers, so something else to take into consideration. Unfortunately, we did have a backorder (as you can see all the complaints below). However, we have since rectified any backorder issues. Of course though, much like myself I would be extremely weary too, so I understand and can't hold that against you:) But based on what I am hearing, I would give it a chance:) Have a Great Day! Kate. I would like to know how to cancel an order. I placed the order, wasn't able to put in the shipping address, and I haven't received the email, so I need to cancel to be able to place it correctly. How is product shipped is mail or UPS or Fedex? Thank you. Thank you for your quick response to my question. VII appreciate that very much. I will be ordering soon. Again Thank you. If I ordered two leg pillows, will I get two head pillows free via TV ad? Good Morning Norma, The two head pillows are the Free offer for the TV ad, so yet you would get those as well unless you opted out of the head pillows. If you run into any other questions, feel free to reach out directly to our customer service team at support@legacypillow.com. Have a Great Day! Kate. Interesting Concept, but Doesn't Work! Took about a week to get the pillow, but that's OK and to be expected online orders usually do take a week. Used the pillow as instructed for 2 nights. Great, if all you want is to keep your bony knees from rubbing, but will never prevent a backache and caused me to wake up a couple times to reposition the pillow. What the heck, figured it was worth $25. To find out if it worked! It doesn't and I wouldn't recommend it for my worst friend! Good Morning Howard, While I am happy to hear about it relieve your knee discomfort, but apologize it didn't help with back pain. Each persons root cause of pain varies, while this may not have worked for you, there are thousands of others it has worked for. I am glad you gave it a chance though, and remember it is covered under a 90 Night Comfort Guarantee:) Let us know if you run into any other questions, Have a Comfortable Day! Kate. I needed to contact this company by phone, now I see horrible reviews. When will my order ever come? I clicked that I wanted the deluxe. Of course, since showing pictures of outside the cover. It seemed only the deluxe had the holes, the other leg pillow didn't have the holes for ventilation! So I clicked on deluxe for both the pillows I ordered. Except. The final order showed only one charge for $5.98? And not two. So even though I clicked that I wanted both pillows to be deluxe. The receipt showed a $5.98 charge for the 5-year warranty which seemed to come with the option of getting the deluxe pillows. Good Morning Sandra, I do apologize for this experience. I do want to be able to resolve this for you. And yes why you can see all these issues from customers who ordered previously and are understandably frustrated due to the backorder - we do want to be able to resolve any issue we can and make this right for everyone:) If you could, please send me your order number or email and I can have our customer service team look into this for you. You can email me directly at support@legacypillow.com or contact us at 800-950-0230. Have a Comfortable Day! Kate. An ordered month ago haven't received email or pillows. Looked at my checking account have been charged. I cannot get a response. I called BBB today to report and ask them to investigate. I will never order from TV ad again. The company is a sham! Good Morning Nancy, I apologize for your frustration, as the Legacy Leg Pillow was on back order. In your email confirmation, we do include an expected delivery date at the bottom of the email right below your order details. If you have not received that email, you would need to reach out to the customer service team directly. If you want to provide me your order info and details, I can also send it over to them. However, if you did order a month ago, and you have not received any update, and your card was never charged, it means your order was never processed due to incorrect payment details. You can reach out to customer service for more information at 800-326-4915. Have a Comfortable Day! Kate. I think I just ordered two sets of the special on TV. Why is there no order confirmation that comes up when you hit process order? Hey Kathleen, Are you referring to when you order online or when you place your order over the phone? Please note that the confirmation number is also in the email you receive as well. Thanks! Kate. Ordered a month ago, paid extra for "rush" and am still waiting. Tried the customer service number from the original order page and was told they aren't the company, just the shipping facility and can't look up any orders and have no pillows to ship. They gave me another number to call. No answer. I tried emailing the address listed for my order date. Returned as undeliverable. Tried emailing the other two addresses and so far one of those has also bounced back as undeliverable. This is BY FAR the worst fulfillment and customer service I have ever seen. Their logistics must be an absolute mess, and they'll go out of business if they don't fix it ASAP. If the company line is going to now be (as stated in Kate's replies above) that "Typically there is a 6-8 week processing time for all TV campaigns (or catalog) orders" then they should disclose that to customers during the ordering process and have it clearly posted online, on their site, not a third party one, as well as in the order confirmation emails. And they certainly should not be upselling "Rush" options that they cannot actually accommodate. This isn't 1985 and I didn't order by mail with a self-addressed stamped envelope. It's 2019, I bought this online. We are in the age of 2-day shipping and these incompetent frauds are trying to convince customers it's totally normal to have to wait a month or more. I'm not wasting another minute on them. I'm calling my bank and disputing the charges. The multiple undeliverable emails and recorded call to their number telling me they can't help will be plenty to secure a chargeback. Hey Erin, I hear you loud and clear trust me - I am just as agitated with the process and I work here! As we are a small company we had to outsource customer service, in which it seems you haven't received the same level of customer service as we have hoped - which will be addressed with the teams. I totally agree with all your points. The email comes from a no-reply address, therefor would bounce back as undelivered. If you provide your order number & name I can look further into this for you. If you ordered after 12/31 - you can use the website customerstatus.com as well to find out your order status. Thanks! Kate. Why don't you all stop running the ads on TV UNTIL you all can get caught up with production and orders? Seems like an easy fix--stop running the ads, take care of fulfilling orders previously placed, regroup, hire more help and get it done. Seems like you might have a great product here with a successful future, but you've got to stop and take stock! Good Morning Charlene, I agree - unfortunately, when you hand over money to the media people - they can't stop until it runs through the campaign time originally set. However, we do have all back orders shipped and rolling inventory in the masses. Half of it is we didn't expect the high volume, and the second part is the break down in being able to keep up for sure. We identified the bottlenecks and bandaged them up, so moving forward we should be smooth sailing with the entire process. Thanks! Kate. So, I have seen numerous reviews. Does anyone actually have one of the pillow? Sounds like a lot of customer service reviews, but how's the pillow? Heather, There are thousands of people that do have the pillow. What you are seeing here, is people who were placed on back order. That sense has been resolved. So moving forward, hopefully, we can populate some more actual reviews of the product versus the backorder issue:) Let me know if you have any other questions, Have a Great Day! Kate. Cancel my order which was placed today Jan. 27, 2019 . Would like confirmation on cancellation immediately. Good Afternoon Pat, Please note this is not the Contour Legacy website. Please use the Customer service information from getlegacypillow.com. You can reach customer service directly for any order modifications at support@getlegacypillow.com or 800-326-4915. Thanks! Kate. Is the legacy pillow in stock at this time? Hey Kevin, Yes the Contour Legacy Leg Pillow is in stock and shipping as we speak:) Have a Great Day! Kate. I ordered through your customer service 2 leg pillows, after not receiving order confirmation I reordered online. I called my card company and no charges were made yet. I do not need 6 knee pillows. Which order is complete and will I be charged after pillow sent out? Reviews looked bad but I see your response. Please respond. Good Morning Leanne, We definitely want to take care of this for you, and as orders ship, I want to be sure it's correct, so if you could, please contact Customer Service and they should be able to update your order. They can be reached at support@getlegacypillow.com or at 800-326-4915. If you still need further assistance, you can reach out to me directly. Have a Great Day! Kate. I made a mistake on my order. I can't find a phone # to call. I accidentally ordered a 2nd pair of knee pillows for 39.98. Please cancel that part of the order. Please call me to verify this. 678-480-1300. Thank you Linda Butts Or email me. Hey Linda, You can click on Customer Service on the website, which will take you to all our Customer Service info. You can reach customer service at 973-287-5108. Have a Great Day! Kate. I ordered this pillow around January 3 and have not received it. Called two times and talked to Wanda both times. She said that my pillow will be shipped in a couple of weeks. I asked for a confirmation e-mail and have not received a pillow or e-mail! Very poor customer service! Same thing here. I ordered on Jan. 2. Nothin yet, it's February. Called the number I was provided, was told they don't actually handle it, that they just do the shipping for the company and was given another number that led nowhere. Tried emailing. The email address listed for my order date was returned as undeliverable. Tried emailing the other two emails and one more came back as undeliverable. Waiting to see what happens with that third one. You'd think when you pay the extra money for the "Rush" option, in this day and age of 2-day shipping, it would take less than a month to get your order! Don’t buy anything from getlegacypillow. Hey Glenn, Sorry you feel that way:) You can always buy it on Amazon - 2 Day Free Prime Shipping and all:) Kate. Sorry, Kate, you're sadly mistaken. Amazon is offering it with free shipping but not Prime Shipping. Which indicates to me that shipping will be free when and IF they get around to it. I was considering ordering but not with this degree of service. I'll take my order somewhere where the customer satisfaction is above 4 not 1.3 like yours. Hey Sandra, It does look like they were out of inventory and should have come back this week. Unfortunately, we can not control when Amazon processes and fulfills their orders. I completely understand you wanting to take your order somewhere else, and I myself would be wary of a 1.3 rating. However, please note -that this is not the norm and largely caused by the backorder we seen solely. Have a Comfortably Day! Kate. Need update on my order. Hey Ray, Can you please send your order number & inquiry to support@legacypillow.com so we can investigate this for you. Thanks! Kate. Thank you so much for reviews! Was excited about ordering but will not know! ☹️. Hey Suzy! Just note, all these reviews are from people who were on back order - hardly a fair gauge in product performance. If you still are on the fence, you can always use Amazon and your Prime account. Have a Great Day! Kate. I was considering ordering this for myself & 1 for a family member. I'm very shocked to see nothing but bad reviews. Very disappointing! Hey Dawn, We completely understand that decision. Unfortunately, some orders have gone on back order due to our last production run and some issues with quality. Just note, the reviews are simply about that - which should all be rectified this week or next, and not product performance. If you have any questions or concerns, please feel free to reach out directly to me at support@legacypillow.com or at 800-950-0230. Have a Great Day! Kate. So I ordered legacy pillow online on January 5th. Like everyone else never got it yet. Found a link to customer support on their page. The link doesn't work. They don't accept on their end. Will try the phone number this week. If they answer I will post here. Kate are you listening? Hey John, I will have our team look into this, thank you for letting me know. So just to clarify, and I can get back to the web designers, you click on the link and nothing happens? Can you tell me what kind of operating system you are using and browser? The good news is, while we did have a highly unanticipated response with the Legacy Pillows - all orders are starting to ship this week. You can reach our customer service team at 800-326-4915 or support@getlegacypillow.com. If no one responds to you (as it is handled all by our CT fulfillment team) in a timely manner, please let me know - I can be reached at support@legacypillow.com. Have a Great Day! Kate. I too ordered on Jan. 5 and still have not received the item or an email explaining the holdup. I tried emailing you at the link in the confirmation email. Did not work. Said no emails being accepted. What is going on! Hey Diana, The email is sent from an automated system, the customer service information should be in the footer if not on the website. You can reach out to Customer service at support@getlegacypillow.com or at 800-326-4915. Have a Great Day! Kate. I ordered one Jan 5th luckily I screenshot my order and order number because I do not receive an email confirmation. I tried emailing the email on your website and was locked back. I also called the 1800 number on your website and just rings. I will report this to the BBB horrible customer service and as it appears from all and I mean all reviews everyone else is in the same boat. If I could provide my screen shot of the email I sent that was locked back I would. I sent it directly to the one you have on your webpage. Horrible horrible company. I ordered on Jan 3rd and have yet to receive my pillow. Absolutely no way to contact these yahoos. Why would you market something that you can not deliver? Crazy. Do no place an order. Good Afternoon Susan, Our Contact information is on our website under Customer Service. So if you need to contact anyone about an order I would start there. With 99% of all As Seen On TV campaigns, the shipping window is 30 days. Seeing as though you ordered this and that 30 day window is coming up, you should be receiving a shipping confirmation shortly. Just for your records, to reach customer service, you can use any of the following methods: Customer Service Phone: 800-326-4915, EMAIL: support@getlegacypillow.com. Have a Comfortably Day, Kate (aka leader of the yahoos:)). Placed and paid for my order before Thanksgiving 2018. Have yet to receive confirmation or pillow. Extremely difficult to reach Customer Service. Poor service. Hey Jeanne, Our customer service information is right on the website. We have sent out emails notifying of back order status you should of received. If not email was provided, it would of came in regular postal mail. Thanks! Kate. I have NOT received anything. Ordered on January 3rd. Good Morning Susan, If you have not received any sort of confirmation, please contact our customer service team at support@getlegacypillow.com or at 800-326-4915. Have a Great Day! Kate. Cancel one of two Orders. Made one by Mistake. Please cancel one of the two orders I placed Jan 13. I need to know this was done. Ended up being a big mess and can’t get ahold of you on weekend. Please answer this. Monna, I am sorry to hear about the ordering issue you have experienced while going through the checkout process. Please note this is not our website, we typically do not monitor this webpage as it is unaffiliated with our brand. Our customer service is available Mon-Friday from 8:30am - 5pm. They can be reached at support@getlegacypillow.com or 800-326-4915. Have a Comfortable Day! Kate. This is crazy. Cancel my order NOW! Good Afternoon Cindy, Im not sure exactly what you are referring to, but you can always cancel your order by contacting our customer service team directly at 800-950-0230 or via email at support@legacypillow.com. Have a Comfortable Day! Kate. I was considering ordering this pillow, but after reading the reviews of how poor your customer service is and that it can take over a month or more before you get it, if even then, I would not order your pillow. Good Afternoon Charlene, I do apologize, as this item's inventory has exceeded the very unexpected high demand. While we are a small company, I assure you we are working quickly to get all orders out as quickly as possible to get all orders out in a satisfactory time frame. Unfortunately, some orders have gone on back order due to this influx in response. We do know that our latest production run is almost complete, and we are working hard to get everything out as quickly as we can! If you have any questions or other concerns, feel free to reach out to me directly at support@legacypillow.com or at 800-950-0230. Have a Great Day! Kate. I started to buy one pillow then I ordered three before I knew it without a review page to back out the extra pillows. I am not a centipede. In an attempt to change it the website only let me order a fourth pillow. Now I have four pillows on order and no way to contact the company to rectify this situation. They do not have a contact option on their website, no phone number, no e-mail addresses. Just send in orders! Good Afternoon Miss Sandy, I am sorry I am just seeing this - but I believe we already spoke and fixed this for you:) If you have any customer service questions or issues, feel free to reach out to our Contour Legacy team directly at 1-800-326-4915 or support@getlegacypillow.com. Have a Great Day! Kate. I thought I was ordering one legacy pillow and it added up to 4 leg pillows. The total came to $131.92 I want this whole order canceled. Good Afternoon Doyle, I apologize for any ordering issues you may have encountered. You can reach out to our team directly with any order changes or cancellations by contacting us at support@legacypillow.com. Have a Great Day! Kate. Hey Kate, I ordered on of your pillows on 11/15/2018, after repeated calls and finally talking with a Lisa I was told that it would arrive on 01/25/2019.I’ve waited two and a half months to get this and today January 25, 2019 it still hasn’t arrived. I am definitely canceling this order and I encourage everyone else not to buy from you and put up with your scams, order # 2000244. Hey Glenn, I am with you completely. However, everything that could go wrong did with this offer. Our production run in November was not up to our quality standards, which is why we had to delay these orders, plus we never expected the high response we ended up receiving from this promotion. To say a scam is hardly fair, because atleast we are shipping these items out opposed to people who dry test on TV leaving customers in the wind. But I get the frustration, I do. The last thing I pre-ordered was a vinyl for my father for Christmas that ended up being a 6 month wait. Apparently 70's rock on vinyl is still in high demand:) We have shipped everything to date as of Friday, if you have any issues please feel free to reach out directly, Have a Comfortable Day! Kate. It's been a week and no news about my order, don't even know where to cancel it, nothing on website or available to ask questions. After reading these reviews I'm not sure I want it. No place to contact anyone ,is there a customer service site? Good Afternoon Dawn, Actually our customer service information is posted at the bottom of the website. Just click on the customer service link and it will give you contact information to reach us by phone or email. If you have any questions or concerns, you can reach out directly to us at support@legacypillow.com or by phone at 800-950-0230. Due to it being a TV campaign, there is usually a 2-3 delay in transnational data from the TV Phone/Website system to our fulfillment centers, so I do apologize for any delay you have encountered. Please email us directly so we can verify your contact information as you should of received an email from us after placing an order. Have a Great Day! Kate. Still waiting for pillow. Been 3 weeks. Can’t locate customer contact number. No response via email. Is this a scam? Never buy getlegacypillow. Hey Christopher, I can understand any customer service frustration when you send an email and no response. However, as I personally monitor our email address, I just want to make sure you are sending any customer service inquiries to the correct email, and not the no reply email address that is tied to the order confirmation. You can reach our customer service team Mon - Fri from 8:30-5pm EST either by phone at 800-950-0230 or email us directly at support@legacypillow.com. Look forward to hearing from you! Kate. I have been waiting 3 weeks also and have not heard a word from them. I have tried to contact them to cancel my order and still have not heard a word. Hey Charolet, I personally monitor our inbox daily, I don't believe I received anything from you. If you could please send any inquiry to me directly at support@legacypillow.com. Have a Comfortable Day! Kate. Good Afternoon Rosamond, Please submit any cancelation request directly to our customer service team at support@legacypillow.com to ensure your request is processed. Thank you. Have a Great Day! Kate. i ordered my pillow on 11/26. I received an email immediately but a month later, nothing. Good Afternoon Bill - I do apologize for the delay, as you should have received a shipping notification status email or post card from us in December. Typically there is a 6-8 week processing time for all TV campaigns (or catalog) orders. Please send us an email at support@legacypillow.com with the order number or name on the order so I can investigate this further for you. Have a Comfortable Day! Kate. Is it a Scam? Not Replied in 1 to 3 Days? Order! So this is my second post and this is what it said to do and a knowledgeable customer or representative of Legacy Leg Pillow will respond usually in 1 to 3 days. Hmmmm. So December 13 this one I posted and it’s been seven days. So what happened to 1 to 3 days to respond where my order is? Very interesting! So is it a scam? “Your best bet is to post on the Legacy Leg Pillow Review page found here: https://TVStuffReviews.com/legacy-leg-pillow. A representative of Legacy Leg Pillow, or a knowledgeable customer will see your post and respond. (Usually within 1-3 days) - Read more at: https: //TVStuffReviews.com/legacy-leg-pillow#review-form”. Legacy Leg Pillow Customer Service staff don't search the internet looking for people asking questions on review websites. Its great to post your reviews and concerns here but if you want a response from customer service then you have to contact customer service. While there is a possibility that they will see your post on TVStuffReviews, that is not the best means to contact them. Thank you for that comment. It is true, the only reason I knew this site even existed is because we were getting referrals from it which was identified in our site analytics. Good Morning Shelly, Again, I do deeply apologize about the frustration. However, we do not monitor or have any affiliation with this site. So I apologize for any lapse in response. Again, we are working diligently to get all orders out in a timely fashion & as soon as we can. Since I started working with this company, my main goal was always to provide the best service we can to each and every customer, and I can not stress how deeply sorry we are for the delay, but we are working on it, and working towards a solution to ensure this backorder will not happen to anyone else. However, the response & orders we received surpassed even our highest expectations. Please feel free to reach out to us directly, our Customer Service team can be reached at 800-950-0230 Monday – Friday from 8: 30am-5: 30p EST or you may reach out to me directly at 704-944-2818. Have a Comfortable Day! Kate @ Contour. I ordered 2 Contour Legacy Leg Pillows 3 weeks ago and have not received an email saying they have been shipped and have not received them. I cannot find any contact information on the website. Wondering if this is a scam website. Likely not a scam, but rather a test product that isn't actually being sold yet. Good Morning Blanca, Thank you for your response to these customers. You are right, this was a pre-test before we officially launched the product. However, unlike most companies, we actually are shipping these orders :) We just didn't expect to see the response it did. Thank you again for your positive response and understanding about DRTV. Hope you Have a Comfortable Day! Kate. Good Morning Sandra, I am sorry that our contact information was not easily accessible online. You should of received an email stating that your item has been placed on back order. If no email was provided, we did physically mail a postcard (it may have gotten missed). Per the backorder notification, all pending orders are expected to ship mid-January once our current production run is finished. We are neither a new company, nor a scam company and your order is currently pending, your card has not been charged, and only will be charged once your item is ready for shipment. Each and every customer is important to us, so I appreciate you bringing this issue to our attention, in which we will work quickly to resolve in order to provide the best customer service possible. Should you have any questions about your order, or wish to cancel (if you haven’t done so already), feel free to reach out to our Customer Service team at 800-950-0230 or you can reach me directly at 704-944-2818 or kambrose@contourliving.com. We appreciate your patience and look forward to providing you a comfortable night’s sleep! Have a Comfortable Day! Kate @ Contour. I ORDERED MINE #2000312 ON NOV. 18TH AS CHRISTMAS GIFT SO WHERE THE HELL IS IT? Good Morning Lorita, We had sent 2 emails (or postcards) noting the backorder status of any active order that we had. 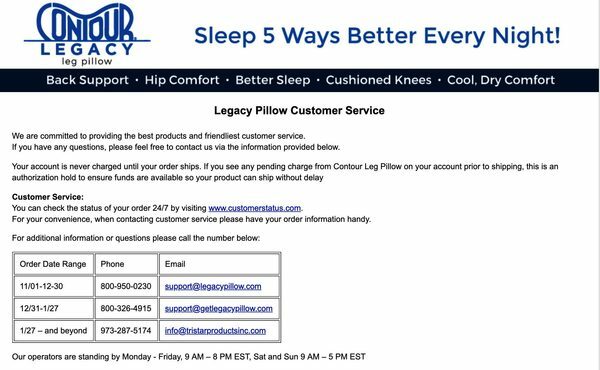 Please note, we don't monitor this 3rd party website, so if you have any legacy order questions about the status of your order, please call our customer service at 800-326-4915 or by email at support@getlegacypillow.com. Have a Great Day! Kate. I did the same thing as you. I got one email notification that they received payment and that was two months ago and I haven’t heard a word since and there’s no way to contact them back . Can we cancel the order, I see no place for it. Hey Glenn, Please check your Junk or spam folder as we have sent multiple back order notifications if your order has not shipped yet. Our customer service information is listed on the website. But should you need to contact the customer service team, they can be reached at 800-326-4915 or via email at support@getlegacypillow.com. I do also want to note, our production run is almost complete, so all back orders will be shipping shortly. I apologize for this delay, as the demand exceeded any forecasted expectations, and we are all working very hard to get all orders out as soon as we can. Have a Comfortable Day! Kate. I completely understand the frustration you may be experiencing. While this was our first run on TV with the Contour Legacy Pillow, we did not expect the huge response we received. Unfortunately, we were unable to fulfill all the orders that were submitted, and could not ship your order. If your item has not shipped, you should have been notified either by email (if provided) or through the regular mail as we then sent a post card to your shipping address (it may have looked like junk mail, so easily missed). As far as the contact information, I will discuss this with our development team so all customers have access to contact us directly with any questions or concerns. Not only is your comfort important to us, but your satisfaction and experience with our brand. If you have any questions or concerns about your order, feel free to reach out to our Customer Service team at 800-950-0230 or you can reach me directly at 704-944-2818 or kambrose@contourliving.com. We appreciate your patience and look forward to providing you a comfortable night’s sleep!